Sitting at 3,500 feet and surrounded by 5,000 foot mountains, our Cashiers NC Blue Ridge Cabin Rentals have been a haven for those folks looking for a quiet and peaceful spot in Western North Carolina mountains. This very small town has a wonderful array of antique and specialty shops, which offer such items as handicrafts, art, clothing, accessories and other gift shops. Cashiers has the charm to “take you back” to gentler times. Nestled in the heart of Western North Carolina and part of the Blue Ridge Mountains, Cashiers, NC offers one of the areas most pristine attractions and luxury lakefront rentals. Our Cashiers vacation rentals rest at 3,487 feet above sea level, but if you want to go higher a hike to nearby Yellow Mountain quickly puts you at an elevation of 5,127 feet. The weather offers four lovely seasons. The sought after high elevation summer air is always clean and great for escaping the humidity typical of most of the south east. Autumn is absolutely spectacular, winters will offer up some great snowfalls, and spring is lovely with wild blooming dogwoods and iris. Staying in one of our Cashiers NC cabin rentals in the great Smokey Mountains offers you lakes and many waterfalls with endless breathtaking hikes, great outdoor water recreation including kayaking, skiing, whitewater rafting and canoeing and fishing. Along with hikes to mountain tops and waterfalls, our Cashiers lodging offers great opportunities for golf, tennis, mountain biking and climbing. Cashiers village offers great shops and restaurants along with live music events and art fairs. 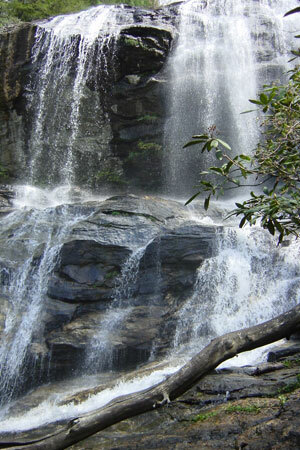 Click here to find out more about Things to Do in Cashiers NC. From Lake Glenville Dam to the base of High Falls on the Upper West Fork of the Tuckasegee River. From Cashiers, drive 6.7 miles north on NC 107, turn left on Pine Creek Rd. (SR llS 7). Continue 1. 7 miles to parking area on right across road from Pines Recreation Area. 6,300 acres of the Nantahala National Forest. From Cashiers, drive 2 miles east on US 64, turn left on Cedar Creek Rd. (SR 1376). Continue for 2.3 miles, turn right on Breedlove Rd. (gravel) for 4 miles to parking area. Highway 107 South from cross-roads for 9.2 miles to first left turn after crossing state line. Continue 2.2 miles to next stop sign.Turn left and go another 1.2 miles to parking area. Take 64 West about 7 miles to Buck Creek Road. Drive about 2.3 miles and look for trail going up the bank on the right. Natural water slide into swimming hole in the Chattooga Wild & Scenic River, Nantahala National Forest. From Cashiers, drive south on NC 107 for 1.7 miles and turn right on Whiteside Cove Road. Continue for 2.7 miles crossing a bridge just before the parking area on your right. Limited parking available for approximately 8-10 vehicles. Swimming hole at base of waterfall on Silver Run Creek, Nantahala National Forest. From Cashiers, driye south on NC 107 for 4.1 miles and turn left into small gravel parking area. Difficult 6.25 mile trail along Chattooga River from Whiteside Cove trailhead to Iron Bridge in Bull Pen, Nantahala National Forest. From Cashiers, drive south on NC 107 for 1.7 miles.Turn right on Whiteside Cove Rd. (SR ll07). Continue for 4.25 miles to parking area on left. Take Horse Cove Rd. 4.3 miles from the corner of Fourth and Main St. in Highlands to the end of the pavement. Turn left onto Whiteside Cove Rd. and drive 0.9 miles. The trail is on a logging road on the right and descends 2 miles to The Narrows. You will pass a trail to the right, which continues to Bull Pen Bridge on Horse Cove Rd. Be sure to return the way you came. Turn on Bull Pen rd., about 2.5-3 miles park on the right in the gravel just after Fowler Creek Bridge, walk back over the bridge on the opposite side of the road is the trailhead.